Tsawwassen Ferry Terminal from the air. The Tsawwassen Ferry Terminal is an approximately 23 ha (57 acres) major transportation facility in Delta, British Columbia. It is located at the southwestern end of an approximately 3 km (2 mi) man-made causeway that juts out into the Strait of Georgia off the mainland at Tsawwassen and is less than approximately 500 m (550 yd) from the 49th parallel, the Canada–United States border. The terminal is part of the BC Ferry system, as well as part of Highway 17. It is also the largest ferry terminal in North America. The search for a mainland ferry terminal in the late 1950s that would connect British Columbia's Lower Mainland with the Victoria area on Vancouver Island involved an extensive scouting of locations from Steveston to White Rock. Despite criticism of rough seas and bad weather, the favoured site soon became the area offshore from the Tsawwassen First Nation Reserve. Construction of the terminal began in 1959, after provincial transportation Minister Phil Gaglardi, on divided engineering advice, selected the site. Construction of an artificial island began, and the causeway was built from the island back towards the mainland. This endeavour used an estimated 2.3 million cubic metres (3.0 million cubic yards) of boulder, rock, and gravel fill. To connect Highway 99 to the new terminal, an 11-kilometre-long (6.8 mi) freeway was constructed from near the southern end of the Deas Tunnel through the edge of Ladner. This became a portion of Highway 17. The isolated causeway location of the terminal, while criticized locally in its formative years, has allowed and continues to allow terminal expansion to cope with growing vehicle traffic. In 2003, the Tsawwassen First Nation filed legal action in the BC Supreme Court over the destruction of the foreshore and other concerns caused by the impact of the terminal and the nearby Roberts Bank Superport. Concerns were also expressed in 2005 about eutrophication, or a destructive bacterial buildup in the waters between the terminal and the Roberts Bank facility. Currently there are five ferry berths at the Tsawwassen Ferry Terminal. 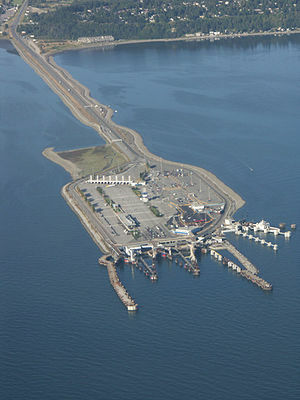 The terminal primarily serves routes travelling to the Swartz Bay Ferry Terminal, north of Victoria, and the southern Gulf Islands. In 1990 a connection from Tsawwassen to Nanaimo called the "Mid-Island Express" was established, providing the fastest surface connection between Northern Vancouver Island and the border with the United States at Blaine, and, since the opening of the South Fraser Perimeter Road, to the Fraser Valley and points east. The route ran to Departure Bay until 1997, when the Duke Point Ferry Terminal opened. The quickest line between the terminal and the Active Pass, for the ferries travelling to the Gulf Islands or to Swartz Bay, passes over approximately 8 km (5 mi) of United States waters in the Strait of Georgia. In the mid-1990s a major renovation and expansion of the terminal was undertaken. The terminal is served by public transportation through Translink's 620 bus route. BC Ferries Tsawwassen Terminal, with Roberts Bank Superport at back left. Wikimedia Commons has media related to Tsawwassen BC Ferries Terminal.